His many books of poetry capture the Yankee soul, and the quintessence of New England living	in the early 20th century. 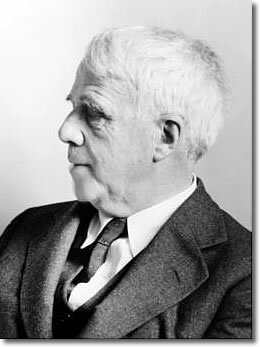 Robert Frost (1874-1963) was born in San Francisco, but his family had lived in New England for generations. He moved to New England early in life, attended Dartmouth College and Harvard University without taking a degree, and later returned to teach poetry at Amherst College and Harvard. He lived and worked on two farms in New Hampshire now preserved as museums and monuments to the poet: The Frost Farm in Derry NH, and The Frost Place in Franconia NH. Frost's poems usually take New England rural life as their settings, but in fact explore deeper, more universal philosophical themes. Frost's poetic language is deceptively simple, supposedly echoing the plain speech of country people, but in fact tightly composed and evenly weighted. Just about any American born before 1960 knows Frost's "The Road Not Taken:"
Winner of four Pulitzer prizes for poetry, Frost also read his poem Dedication at the inauguration of New England's own President John F Kennedy in Washington DC in 1961. 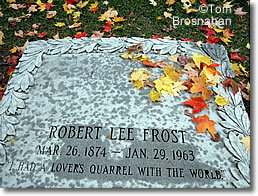 Robert Frost died in his 89th year in Boston in 1963. His grave is in the churchyard of Old First Church in Old Bennington VT. Frost's grave in Bennington VT.